The Braille Sense U2 is the sleekest and lightest 18-cell Braille notetaker on the market today. But don’t let its diminutive size fool you. It’s packed with advanced hardware like an integrated digital compass and a built-in GPS receiver. The Braille Sense OnHand also includes robust software designed with your productivity and independence in mind. The Braille Sense OnHand notetaker for the blind incorporates a refreshable Braille display and a Braille keyboard (Perkins type keyboard). - The Windows-like file manager in the Braille Sense OnHand makes managing files, folders, and various types of memory like secure digital cards and USB flash drives a breeze. - The Braille Sense OnHand lets you create, delete, and rename files and folders, view file and folder properties, write-protect files, and open files of all supported types directly from within the file manager interface. - The OnHand’s file manager also includes the ability to search for specific files anywhere on the device, and it even has built-in support for zip archives. - The Braille Sense OnHand supports the viewing and editing of several commonly used file types. Text, rich text, doc, docx, brl, and brf are all supported, and another unique format called hbl is also included. - Whether you’re typing in grade 1, grade 2 or computer Braille, the Braille Sense OnHand translates among all three, making the sharing of documents with colleagues seamless. - The OnHand allows you to produce hard copies of your work on a wide variety of commonly available printers and Braille embossers, and it also provides ample storage for you to keep electronic copies of all your important work. 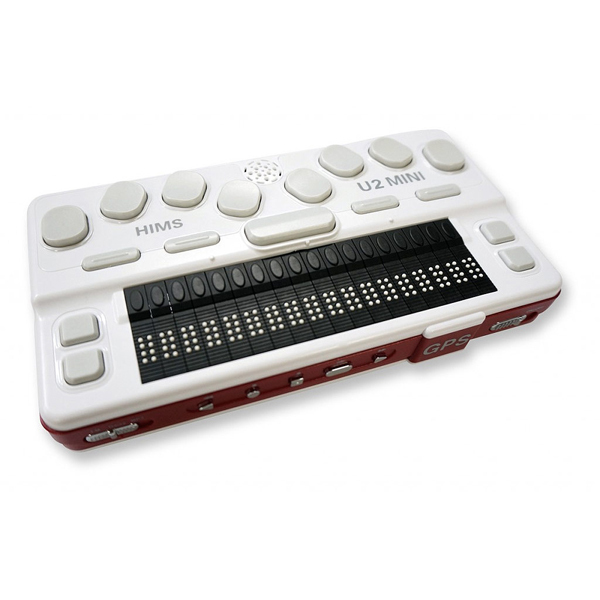 - The Braille Sense OnHand includes a full-function DAISY player which can easily play DAISY content of several different types. - Change the speed and volume of the content being played independent of the speed and volume of the OnHand’s text to speech. - Insert, delete and navigate to marks. Navigate by page, heading, phrase, and level. - Daisy 2.0/2.02, ANSI/NISO Z39.86 (Daisy 3.0), NIMAS and Bookshare.org are all supported. - The Braille Sense OnHand includes a built-in chat program which allows users with Windows Live ID’s to chat with other Windows Live and MSN Messenger users. - The program allows for the addition and deletion of contacts, the changing of status and screen name information, and the saving of conversations. - The Braille Sense OnHand’s email client allows easy configuration of pop3 email accounts. - Use it to read, forward, reply to, and save email messages. - Full automatic translation allows emails to be written in contracted Braille but read in standard text by sighted recipients, and it also allows Braille users to read any emails written to them in contracted Braille. - The OnHand’s web browser is perfect for surfing the web, reading and saving HTML content, and even downloading files. - Create bookmarks and jump to favorite web pages with just a few keystrokes. - Navigation quick keys allow you to move effortlessly between links, text, form fields, tables, and more. - Instant translation makes web pages viewable in contracted Braille, making the reading of content like news articles, dictionary entries, and blogs easy and efficient. - The OnHand’s media features allow you to play a wide variety of file formats. MP3, MP4, WAV, ASF, OGG, WMA, M3U, Audible(AA, AAX), WMV, FLAC, and MID are all supported. - Create and edit playlists, add up to 1000 marks in any audio file for quick and easy navigation, and change audio effects like bass boost, reverb, echo and virtual surround. - Recording of audio in adjustable bit and sample rates can be done either by using the built-in microphone or by connecting an audio device to the microphone jack. Both MP3 and WAV formats are supported for recording. - Many media features can be controlled by the media buttons on the front of the OnHand, so you don’t even need to be working in your media player application in order to enjoy your audio. - The Braille Sense OnHand may be used as a mass-storage device, making the transfer of files and folders between the OnHand and PC’s simple. - No special software is needed to accommodate these transfers. - The Braille Sense OnHand contains an address manager, schedule manager, scientific calculator, database manager, alarm clock, timer, and many other applications designed to enhance your productivity. - You can use the OnHand in conjunction with a screen-reader to view content on your PC in Braille. - Online help is available in every application, making the Braille Sense OnHand easy to learn. - An optional USB LCD display (sold separately) allows sighted users to view the same information shown on the Braille display. This feature can be extremely useful for teachers working with blind students or for communicating with individuals who are deaf and blind. * Weight: 425g / 0.93 lbs. * We are not allowed to sell/ship Internationally.